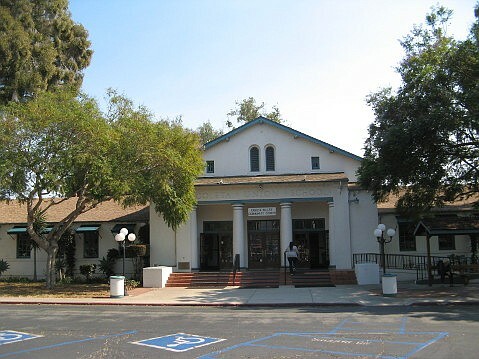 Photo: Margaret Connell The Goleta Valley Community Center has become ground zero of the storefront cannabis debate in Goleta; a well-heeled cannabis applicant wants to move in across the street. Goleta is trying to figure out how to accommodate the complaints of would-be cannabis retailers and to do it quickly. The length of time it’s taking to process their applications — most were filed last August — and the fact that the existing ordinances are changing are among their loudest complaints. But neither the Planning Commission nor the City Council is fond of the solution the city’s planning staff is devising to try to please everyone, which is to put the land-use issues into the cannabis business license. The citizens who spoke at Monday’s Planning Commission meeting like the entire industry even less. Cannabis merchants must obtain a business license from the city; those are fairly straightforward, accompanied by strict regulation by the state. The city’s cannabis ordinances, enacted in July, require land use permits, which require public hearings. Outright denial is a possibility if enough protest is heard. To streamline the process for a lucrative new business, buttressed by the extensive regulations in the state’s license, why not put the land-use issues, which could be defined, in the business license? One-stop shopping! What has happened since that idea began floating to the surface is that 15 applications, the maximum allowed in Goleta, have been filed. Nine were in Old Town. Three were eliminated as being too close together. City officials are now being asked to define how close is too close, also how much of a “no-go” zone should surround a “sensitive receptor” (i.e., school) or home? And should those land-use answers go on a simple line in a business license application? Back in January, the City Council wrestled at length with the alternatives in order to give planning staff their best take on the spatial questions. On Monday, the Planning Commission considered these numbers, too, but this time in the form of various resolutions containing the council’s most agreed-upon solutions. The issues are thorny and personal; they involve children and where people live; the product being sold — legal for adult use since Prop. 64 passed in 2016; licensing began in 2018 — is now both maligned as corrupting and lauded as medicinal. As had the councilmembers, the planning commissioners debated the resolutions at great length. They ended up with a flat no to all of them. The key difference between the two meetings might have been the public that participated. In January, the City Council heard tirades and polite exasperation from cannabis proponents, and also legal representations from no less than a partner with Cappello and Noël, the area’s most formidable law firm. All speakers complained of the ground shifting beneath their feet after having spent tens of thousands of dollars to bring cannabis to Goleta. Some complained that the others were better equipped to win any business beauty contest in the city. As the council discussed those issues and others, what emerged was an extreme discomfort from trying to smash evolving issues into a bureaucratic licensing process. The 15th application had been filed that very day. A few raw facts from the city’s cannabis consultant, Matt Eaton of HDL, flew in the face of the facts in the city. The state Public Health department found one cannabis storefront for every 22,000 residents to be adequate, Eaton said. (Goleta has a population of 33,000.) Prop. 64’s Bureau of Cannabis Control opined it was one for every 15,000-18,000 in the general market. Of the 2,253 licenses issued in Santa Barbara County (as of January 22, 2019), 20 were for retail shops in the region; Eaton estimated the “region” held about 100,000 people. Cannabis grower Brian Adams opined most of the 20 stores were in Lompoc. At the Planning Commission on Monday, the neighborhood turned out, both Old Town merchants and residents, including Charlie Johnson, who runs the Community Center, which holds the Rainbow preschool and the Boys & Girls Club. It’s crazy, he said, it made zero sense that the Goleta Valley Community Center would not be protected from a cannabis shop directly across the street. One of the solutions suggested, placing shop signs and doorways off the street and out of sight, offered no protection to kids participating in events like the Halloween Candy Crawl, the concerts in the park, or the Day of the Dead, he protested. Jean Blois, a former city councilmember, stepped up to agree, adding that kids got off the bus right across from a proposed cannabis shop. The proposal to require a four-foot fence between cannabis shops and any adjacent residence “was a joke,” said Kitty Bednar, a longtime resident of Old Town. The sight impacts needed to be blocked, she stated, with fences or hedges six feet or higher. And that didn’t address the worries about an overconcentration of pot shops in Old Town; it just hid them, she asserted. Cecilia Brown, a county planning commissioner and Goleta activist, called the proliferation of cannabis stores in Old Town a social justice issue. Luz Reyes-Martin, a Goleta school board member and parent, argued there were no more sensitive receptors than children. She, too, noted that “persons of color bear the negative brunt” of proposals such as this. “A 300-foot buffer around the Community Center would put the interests of residents and Goleta families first,” she said. Three of the 11 speakers were from the industry. Coastal Dispensary’s Julian Michalowski offered what a good citizen his company was, giving back to cities and local nonprofits. Erin Weber with Axiom Advisors reminded the commissioners that Prop. 64, which legalized marijuana, had passed overwhelmingly in the city. Tracy Trotter, who has a distribution facility planned by the airport, not a shop, implored the commissioners not to hold him up beyond the nine months and $100,000 he’s already put in. But the solo cannabis business license concept, to be issued without any public or commission or City Council decision-making input, dismayed the commissioners, who analyzed the widely varying circumstances across the city that the license would have to address. Before voting those proposals down, they opined the Community Center buffer should go up to 600 feet; residences should be buffered by 100 feet, a major CUP, or a solid, six-foot wall; and up to four cannabis shops in Old Town were okay. Their “no” votes on the resolutions connected to the business-license-for-conditional-use-permit swap sends the issue back to the City Council to resolve.